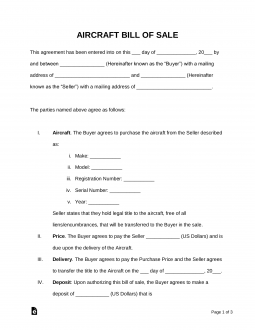 The Airplane Bill of Sale is a legal sales document necessary to record the private transaction of airplanes from a seller to a buyer. It’ll include information relating to the buyer, seller, make & model, and purchase price. 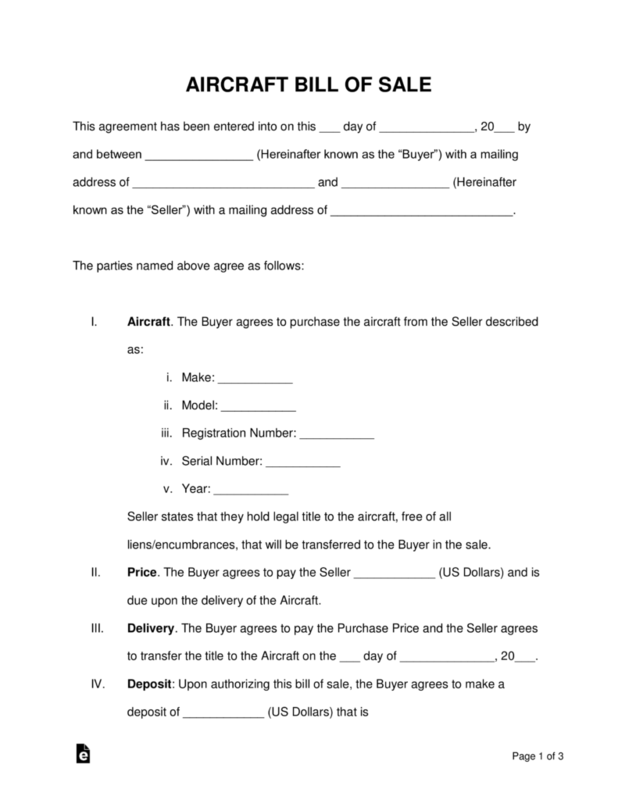 Not only does this document indicate and officiate the sale of an aircraft, it is one of the required documents needed to register your airplane under the Federal Aviation Act. It is important to document everything accordingly to the best of your ability to avoid trouble with local, state and federal laws. How Do I File an Airplane Bill of Sale? Thankfully, all you really need to do is fill out the form we have provided for you. You can download the Airplane Bill of Sale here. Once you do that, follow our step-by-step guide to finalize your sale. First you’ll want to set a price with the seller for the plane. As the buyer, you’ll also want to consider how much you’re willing to put down as a deposit before making the final purchase. You can determine with the seller whether this deposit will be refundable or not and under what terms if it is refundable. Once you’re confident in your choice to purchase this plane, you’ll want to fill out two copies of the Airplane Bill of Sale form. The FAA requires that this form have certain information on record. We strongly recommend that you use our pre-approved form to avoid leaving out any key information. This form also has a number of titled sections that most parties must read and agree to. These sections include terms for: Inability to Perform, Taxes, Assignment, Notice of Parties, Laws, Waiver and Severability. Once all terms are agreed to and the form is filled out, then the buyer must put down the deposit for the purchase. After the bill of sale is complete, the buyer has a certain period of days to conduct an inspection of the aircraft. A skilled mechanic can usually get the job done in a couple of hours depending on the size of the plane. It may take more time for larger corporate or private jets. Once the inspection is clear, then the sale can be finalized. The full purchase price must be paid and the plane must be delivered by the seller on the agreed upon date. The buyer may also choose to fly out with the plane right there and then if they have completed the temporary registration needed first. Now the buyer must register their plane with the Federal Aviation Agency. This can be done by completing an AC Form 8050-1 available through the FAA. The buyer will also need to send the original registration certificate from the seller (with sales information filled out on back), one current bill of sale form, all past bill of sales, and a $5.00 registration fee to the FAA registry in Oklahoma City. Make a copy of the AC Form 8050-1 and place it in the plane as your temporary registration. As required by the FAA, the buyer will need to provide proof of purchase, ownership, and registration. Proof of purchase can be determined by the Airplane Bill of Sale form. You can prove your ownership by delivering the current registration form of the past owner as well as all past bill of sales to show the chain of ownership. Registration can be confirmed by filing an AC Form 8050-1 with the appropriate funds to the FAA.